Ann Arbor Downtown Development Authority board meeting (Sept. 5, 2012): The only agenda item requiring a vote by the board was a resolution encouraging the Ann Arbor city council to adopt a policy that would direct proceeds from the sale of city-owned land to support affordable housing. The mechanism for that support would be the city’s affordable housing trust fund. 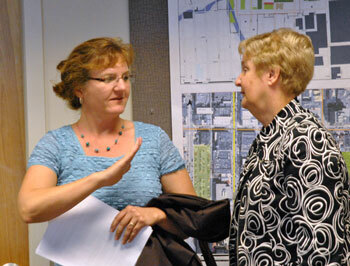 And board members voted unanimously to support the resolution, which DDA board member Sandi Smith had brought forward. Smith, who also represents Ward 1 on the Ann Arbor city council, is planning to bring the policy resolution to the council for consideration at its Sept. 17 meeting. DDA board members were positively inclined toward their own resolution, but sought to clarify that the “proceeds” meant net proceeds – that is, whatever is left after any debt associated with city-owned land is paid off. The loan for the city’s acquisition of the former YMCA lot, for example, still has a principal of $3.5 million associated with it. Smith indicated at the meeting that the resolution she brings to the council might involve the DDA forgoing the repayment on investments it has made in city-owned property – like interest payments on the former YMCA lot or the demolition costs associated with that property. The board also made an amendment to the resolution during the meeting, adding the phrase “a percentage of [proceeds].” The change gives the council flexibility to adopt a policy that doesn’t require the entire amount of the net proceeds to be directed to the affordable housing trust fund. 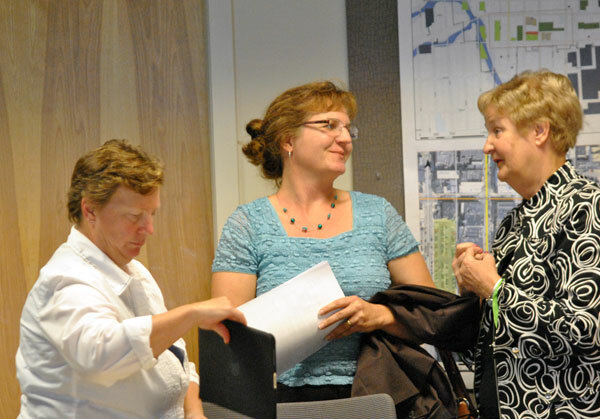 At the Sept. 5 meeting, the board also heard a request from the executive director of the Ann Arbor Housing Commission, Jennifer L. Hall, for a $260,000 allocation from the DDA’s own housing fund. The DDA has a housing fund that’s not necessarily dedicated to affordable housing. But the request Hall was making was for Baker Commons, a public housing project located within the DDA’s geographic district, at Packard and Main. The money would primarily go toward replacing the roof with one made of metal. The board also got its regular update on the parking system. The basic message: revenue is up, and usage is up. The board also had a look at the unaudited financial figures for the end of fiscal year 2012, which concluded on June 30. Except for capital expenses, which were less than budgeted, most categories were on target. The DDA had budgeted all expenses for the new Library Lane parking structure for that fiscal year, but not all invoices have come in yet. The board was also updated on a possible change to the way that transportation planning and funding takes place in Washtenaw County. Discussions by the policy board of the Washtenaw Area Transportation Study (WATS) suggest the possibility that Washtenaw County could form its own metropolitan planning organization (MPO). Currently, the Southeast Michigan Council of Governments (SEMCOG), which includes a total of seven counties, serves as the MPO for Washtenaw County. The change would affect how federal transportation funding is administered locally. 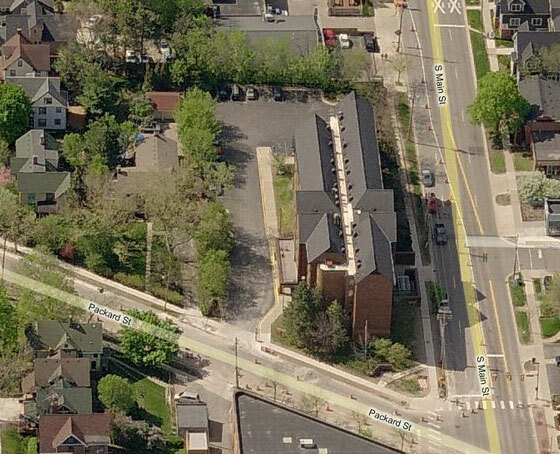 The board was asked to consider a resolution encouraging the Ann Arbor city council to adopt a policy on proceeds from the sale of city-owned land – one that would allocate such proceeds into the city’s affordable housing trust fund. The city council’s resolution will be considered at that body’s Sept. 17 meeting. It’s being brought forward by Sandi Smith, who serves on both the city council and the DDA board. Reporting from the downtown citizens advisory council, Ray Detter told the board that the CAC had also discussed the DDA’s resolution on using proceeds from city-owned land sales to support affordable housing. Members of the CAC have always supported affordable housing, he said. But Detter cautioned the DDA and the city council that the CAC is committed to maintaining and improving the existing low-income housing in the downtown – whether it’s in the form of the Delonis Center homeless shelter, the housing commission’s Baker Commons, or the privately-owned Courthouse Square. The CAC supports rehabbing existing units rather than tearing down existing affordable housing to build new units, Detter said. Sandi Smith introduced her resolution by telling her DDA board colleagues that on Sept. 17 she would be bringing forward a resolution to city council that would direct the proceeds of the sale of city-owned property into the city’s affordable housing trust fund. She observed that, “We have not had a tremendous amount of success in building affordable housing.” It’s something she has watched the community struggle with, she said, during her time serving on the DDA board and on the city council. The funds need to come from somewhere, she stressed. She contended that insufficient affordable housing units are being provided in downtown and near downtown. The recent failure of the Near North project hammers the point home, she said. So she wanted to ask for the DDA board’s support in bringing the city council’s resolution forward. She allowed that the city council resolution was not yet in final draft form, so there is some ambiguity about it. Roger Hewitt wanted clarification that the “proceeds” of any sale would be considered after the payment of any debt attached to the property. Smith pointed out it’s not a benefit to the city to leave a debt unpaid with nothing behind it – saying that would not make a lot of sense. Proceeds would be construed as “net” proceeds, she said. Hewitt indicated that he was comfortable with that. He also pointed out that the DDA’s resolution was an advisory resolution only – because it’s ultimately a city council decision. John Mouat indicated his support for the notion, saying it was a terrific idea. But obviously, he said, the “devil is in the details.” From his perspective, he would prefer to see the proceeds from city-owned land sales not simply go into the general fund. Mouat also pointed out there might be some things the city needs to provide as incentives – to help realize the community’s vision for those parcels. So he liked the concept of reinvesting the proceeds of the sale in those parcels themselves or putting proceeds into the affordable housing trust fund. The amendment was approved unanimously. Outcome: With no further discussion, the DDA board approved the resolution encouraging the city council to adopt a policy directing a percentage of the proceeds of city-owned land sales to the affordable housing trust fund. During public commentary at the start of the DDA board’s meeting, Jennifer L. Hall – executive director of the Ann Arbor Housing Commission – addressed the board. She discussed a request for $260,000 from the DDA’s housing fund, the bulk of which would be put toward the replacement of the roof of Baker Commons. By way of background, the DDA’s housing fund is not the same fund as the city’s affordable housing trust fund. The DDA’s housing fund receives money through transfers from the DDA’s tax increment finance (TIF) fund. It currently has a balance of about $1 million – $400,000 of which is committed to Village Green’s City Apartments project, and another $500,000 of which had been committed to Avalon Housing’s Near North project. It was recently announced that Near North will not go forward. Baker Commons roof. View is looking to the south, across the intersection of Packard and Main streets. Hall noted that the Ann Arbor Housing Commission is the public housing authority for the city of Ann Arbor, which has jurisdiction for about 360 city-owned units. The housing commission also administers about 1,400 federal housing vouchers for the entire Washtenaw County. Ninety percent or more of the population served by the Ann Arbor Housing Commission are extremely low-income residents, Hall said. Most of the people who live in housing commission units are disabled or elderly and many of them do not have jobs. So it’s really the lowest income folks in the community who are served by the Ann Arbor Housing Commission, Hall said. The housing commission has only one property within the Ann Arbor Downtown Development Authority district, Hall explained – Baker Commons, on the corner of Packard and Main streets. 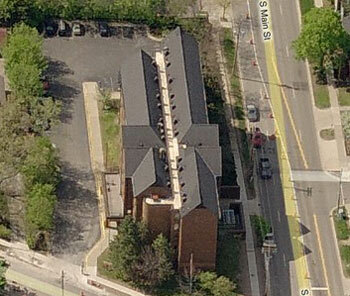 So she wanted to make a request to fund a current urgent need: a roof for Baker Commons. The roof has had ongoing leaking problems, and the housing commission has undertaken periodic patches. However, in the last year or so it is gotten much worse, Hall reported. There has been leakage into housing units and damage to the roof trusses, she explained. For all of the housing units, the commission is trying to move towards doing more long-term cost savings – so rather than replacing the Baker Commons roof with an asphalt roof, they explored using a product that would last longer and realize long-term savings. So the housing commission went out and got a bid for a steel roof, which came back at $246,000. There are many advantages to a steel roof, Hall said. The only real disadvantage is the increased upfront cost, she explained – which is about three times more than an asphalt roof. On the other hand, she said such a roof can last forever – as long as you keep repainting it. The original guarantee is 20 years for the roof, and as long as you keep repainting it, you should never have to take it down to replace it. From left: Jennifer Hall appears to be showing Leah Gunn how steep the Baker Commons roof is. Hall noted that the roof of the building has an extremely steep pitch, so it is a very expensive project to replace the roof no matter what kind of roof is put on – because it’s a high-rise building with such a steep pitch. The commission would like to replace it once, and then have it last for a very, very long time, she said. Some of the benefits for the steel roof include: no off-gas; resistance to wind, fire, mildew, insects and rot; extended life for air-conditioning units; decrease in attic temperatures; and decreased energy use overall. It decreases the heat-island effect. Hall also pointed out that the product that the housing commission has chosen was made in Michigan. A few additional items, for which Hall requested funding, fell into the category of energy-saving devices – programmable thermostats and occupancy sensors for interior lighting in common areas. The programmable thermostats are estimated to save $50 per year for each of the one-bedroom units in Baker Commons. The sensors would be estimated to save around $770 a year. Mayor John Hieftje made remarks generally supportive of Hall’s to request on behalf of the Ann Arbor Housing Commission. He said the 30-year funding trend across the nation for housing commissions was downward. Board chair Leah Gunn suggested referring Hall’s proposal to the DDA’s partnerships committee. Outcome: This was not an action item, and no vote was taken. Roger Hewitt gave an update on the financial reports for the end of the fiscal year, which concluded on June 30, 2012. The figures are as yet not audited, but the DDA is ready for the audit to take place, Hewitt said. There was not too much variation between the budget as amended in May 2012 and the final figures, Hewitt reported. The one area where a considerable difference appears is in capital expenses. TIF (tax increment finance) fund income was very close to what had been budgeted, Hewitt said, as were TIF operating expenses. TIF capital expenses were about $2.4 million less than budgeted. But that money will be spent in the current fiscal year, he cautioned. The parking fund showed a similar situation, he continued. Parking revenue was very close to what had been budgeted. But about $800,000 was not spent, which had been in the parking fund budget – it will be spent in the current fiscal year. For the parking maintenance fund, about $1.4 million was not spent, but will be spent in the current fiscal year. For the housing fund, interest rates were a little bit higher than expected, so there was a bit more income than budgeted. Hewitt then ticked through the fund balances for four funds in the DDA’s budget. The TIF fund has a little over $3.6 million. The housing fund has a little over $1 million. The parking fund balance is about $2.1 million. And the parking maintenance stands at about $1.6 million. Some additional money will be spent on the completion of the Library Lane underground parking structure, he allowed, but the total fund balance is such that it could comfortably take care of those additional expenses. The DDA manages the city’s public parking system under a contract with the city of Ann Arbor. That contract pays the city 17% of gross revenues. The DDA in turn subcontracts out the day-to-day operations of the system to Republic Parking. So the monthly parking report is part of every DDA board meeting. The update on the parking system was delivered by board member Roger Hewitt. The trend that the DDA has seen for the last 12 months – and increasingly so in the last six months – Hewitt said, has been significantly higher revenues. That’s attributable to increased usage and also partly due to rate increases, he said. But the majority of the increase in revenue, he contended, was a function of greater usage of the parking system. In June 2012, revenues were up 19% over June 2012 June 2011, while the number of hourly patrons for the same period was up 2.65%. Hewitt concluded that the hourly patrons are staying longer. Of the 19%, Hewitt estimated 6-8% is the amount of the rate increase. So he concluded there was a 10% increase in revenue attributable to increased usage. Hewitt concluded that it’s fortunate that the new Library Lane underground structure is open, because there is clearly demand for parking. For the fourth quarter, Hewitt continued, revenue in the parking system was up 14% – with hourly patrons just about level. For the last 12 months revenues are up 12% – two-thirds of which was due to rate increases and the balance of which was increase in usage, Hewitt said. Hourly patron numbers for that period were up only about 2%, so the hourly patrons are staying longer, he concluded. Hewitt concluded that demand and the financial condition of the parking system are very strong. The initial numbers for the first 10 days that the new structure had been open, Hewitt said, were 4,000 hourly patrons in the first week, which meant $45,000 of revenue. By way of background on rate increases, the DDA board approved additional rate increases on Jan. 4, 2012. Some of those increases were just recently implemented, starting in September 2012. Rate increases implemented starting in September include those at parking structures and lots, where rates climbed from $1.10 per hour to $1.20 per hour. But other changes were implemented starting Feb. 1, including a change in the billing method at parking structures and hourly lots – from half-hourly to hourly. To compare the hour-increment billing method to the half-hour billing method, assume that parking times are evenly distributed among those people who parked between N and (N + 0.5) hours and those who parked between (N + 0.5) and (N + 1) hours, where N is some whole number. On the hour-increment billing method – for the current hourly rate of $1.10 – the first group would pay for N + 1 hours, or roughly $0.55 more than under the half-hour-increment method, when they’d pay just for N + 0.5 hours. The second group would pay for N + 1 hours under either billing method. So by changing from half-hourly to hourly increments, half of the roughly 2 million annual hourly patrons would pay $0.55 more – generating roughly $550,000 more revenue annually. Hewitt complimented Republic Parking manager Art Low on the management of the system during the art fairs in July. On the Friday of art fairs, for the first time in the history of the parking system, every single parking structure was full at one time – and that had never happened before, Hewitt said. Of course, Hewitt pointed out, it was during the art fairs. But that included three levels of the underground parking structure that were open to the public. [It has four levels, which are now all open.] So it was a very, very busy day, he concluded. Art fair revenues were up 30% over last year. Part of that is having extra capacity and part of that is having very good management of getting people into the structures, he said. Attendants will still be available in the structure, Hewitt explained, but they won’t be sitting in a booth working exclusively as cashiers. A lot of parking systems across the country are moving in that direction, he said. It makes for shorter lines when exiting and a more efficient operation, he said. The Fourth and Washington structure is in the process of having the equipment installed. And the equipment has already been installed at Liberty Square. Up to now, Liberty Square had been designated strictly for monthly parking permits during the day. Now, over 100 monthly permit holders had moved into the underground parking garage, so some hourly spaces are opening up at Liberty Square, Hewitt said – and the hourly patrons are using the automated payment system. The following charts and graphs were generated by The Chronicle, based on parking data provided by the DDA. Ann Arbor Public Parking System: Hourly Patrons. The yellow line shows patrons for the recently-concluded fiscal year 2012. The number of hourly patrons was in most months very slightly more than the same month the previous year. But in some months, the number was less. FY 2013 (green) is off to a slow start for hourly patrons compared to previous years. Ann Arbor Public Parking System: Revenue. The yellow line shows revenue for the recently-concluded fiscal year 2012. It reflects substantial increases in every month compared to the same month in the previous years. FY 2013 (green) continues that trend. Ann Arbor Public Parking System Revenue Per Space – Surface Lots. The top two facilities in the system, measured by revenue per space, are the Huron/Ashley/First (bright red) lot and Kline’s lot on Ashley (bright blue). They generate significantly more revenue per space than a heavily-used structure like Maynard Street (light blue). The most erratic performance of any lot appears to be the Fifth & William lot. The dramatic increases starting in late 2009 reflect the closing of the neighboring lot where the new Library Lane parking structure was built. Ann Arbor Public Parking System Revenue Per Space– Structures. The highest revenue-per-space structures (Fourth & Washington and Maynard Street) are still considerably lower than a surface lot like Huron/Ashley/First (light red). Considered as a facility unto itself, on-street meters generate less revenue per space than most other facilities in the public parking system. That’s due in part to the fact that enforcement of the meters does not extend past 6 p.m.
Ann Arbor Public Parking System: Number of Spaces by Fiscal Year. The number of spaces available shows some fluctuation month to month. But the increases in revenue clearly can’t be attributed to an increase in the parking space inventory. Washtenaw: Separate from Seven-County Region? During routine reports, John Mouat mentioned that he is the Ann Arbor DDA’s representative to the Washtenaw Transportation Study (WATS) – a group made up of county and township officials, a city council member and other “various folks” whose job it is to help guide the direction of transportation spending in the county. The world of transportation is a exoteric world of acronyms and other strange things, he said. The organizing body for determining federal funding is the Southeast Michigan Council of Governments (SEMCOG), which is a seven-county organization – dominated by Wayne, Oakland, and Macomb counties, Mouat said. The other point is that for some people, Washtenaw County is seen as unique and different from other counties, he said. Washtenaw County’s interests might be different from the interests of other counties. Other counties might be more interested in roads and bridges and not as much in nonmotorized projects, transit projects and so forth. So it might be possible for Washtenaw County to represent itself better as a separate entity than through SEMCOG. But it’s not a simple matter, Mouat cautioned. For one thing, SEMCOG is against it. Also the Michigan Dept. of Transportation (MDOT) has expressed considerable concern about it. [.pdf of MDOT letter] [.pdf of SEMCOG letter] He himself also has some concerns. He said it’s easy to be attracted to the idea of the county having control over our own destiny, but he feared the potential repercussions of breaking away from SEMCOG. He reported that there has been a bit of tension in trying to get meetings to happen with MDOT. He hoped that in the next couple of months some headway will be made on the topic. Mouat thanked board chair Lee Gunn for attending the most recent WATS meeting in his absence. Gunn reported that not a lot happened at the meeting she had attended. But Mouat had been right about there being tension in the room, she said. Mouat call it a “very tough issue,” pointing out that the idea of Washtenaw County forming its own metropolitan planning organization is counter to the idea of regional planning. So it’s a balance between that and our own interests, he said. The board’s Sept 5. meeting included the usual range of reports from its standing committees and the downtown citizens advisory council. Board chair Leah Gunn announced that there would be a DDA retreat on the afternoon of Nov. 16. More details will be forthcoming. John Splitt gave an update on the completion of the Library Lane underground parking garage. He indicated that the punch lists are still being worked on. He hoped to have them finished very soon. But he confirmed that now all four levels of the parking structure are open. Joan Lowenstein gave an update on the Connecting William Street project. The team is now presenting the draft scenarios to various groups. In the month of August, she reported, the project team had met with 11 different citizen groups, area associations and commissions. More such meetings will take place in September. She also described an upcoming webinar that same evening to introduce the Connecting William Street scenarios. Another public meeting will take place on Sept. 10 at noon at the downtown branch of the Ann Arbor District Library, 343 S. Fifth. That would be a much more traditional meeting, compared to the webinar format. Lowenstein indicated the result the DDA wanted was a somewhat generalized idea of a consensus for massing and density on the sites. Really specific uses are not being proposed – although Lowenstein noted that generally described uses like residential, office, retail, hotel, lodging, and those kinds of things are a part of the different scenarios. During public commentary at the conclusion of the meeting, former planning commissioner Eric Lipson addressed the board. Lipson introduced himself as the general manager of the Inter-Cooperative Council of the University Michigan, with headquarters 337 E. William St. He indicated the ICC was very interested in the Connecting William Street planning process. He thanked DDA planning specialist Amber Miller and DDA executive director Susan Pollay for coming to the ICC to present the Connecting William Street scenarios and to have ICC representatives take the survey. Lipson said he was also there addressing the board as a member of the Library Green Conservancy to keep alive the concept of a plaza on top of the Library Lane underground parking structure. People who have passed by the location, since the completion of the underground parking structure, have probably seen what he has seen, Lipson ventured – namely, that the space between Fifth Avenue and the elevator structure is highly underutilized for parking. The Fifth and William street surface parking lot was full when he’d walked past it that day, but there were only three or four cars on top of the Library Lane structure, he said. That portion of the lot is so obviously a plaza, he said. Lipson also pointed out that the Calthorpe study, commissioned by the city in the mid-2000s, had mentioned in several places a public space and a public plaza. And the Calthorpe study had indicated that the spot where the top of the underground parking garage is located would be a perfect place for such a public plaza, he said. In that report, public plazas and a gathering space are mentioned dozens of times, but there had been no mention of a conference center or hotel space. Why did we have all those charrettes and all that public process associated with the Calthorpe study, Lipson wondered, if it wasn’t going to be used? So Lipson told the board that the Library Green Conservancy was not going to go away, and would continue to advocate for a public plaza at that location – recognizing that there were many other people advocating for other things. John Mouat reported from the operations committee on a concept for establishing a “bicycle cage” at the Maynard Street parking structure – a place where bicyclists could have their bicycles secured inside a fenced-off area accessible with a swipable pass. There would be some costs associated to the bicyclists to access the spaces. He said it might be used by people who have high-end bikes or who have concerns about the security of their bicycles. They would be under a cover. The next steps would be getting cost estimates. Mayor John Hieftje indicated his support for the idea. If the program were successful at the Maynard Street location, Mouat said, it could be extended to other locations. But one of the questions is: How far will people walk? Where would you like to park your bike in relation to where you’re trying to get to? It would help reduce the number of bikes that are parked on the streets, he pointed out. There has also been some ongoing discussion about what to do with abandoned bikes, Mouat said. He reminded the board that the DDA had previously had a role in helping to tag bikes that were abandoned, but that has been deemed “inappropriate.” Nader Nassif pointed out that each of these cages can hold about 50 bikes, so he felt it was a good use of the space. Hieftje tacked onto the discussion of the bike cages an idea he’s floated before to the DDA board – that he believes bicycle riding on downtown sidewalks should be prohibited. He imagined that such a move would generate a lot of public discussion. The Washtenaw Bicycling and Walking Coalition has done some work on the issue, he said. As the number of pedestrians increases, Hieftje said, it’s something he thinks the DDA board should pursue to foster a good pedestrian environment. He contended there is really no problem riding a bicycle on the streets in downtown Ann Arbor. He felt that anybody who can ride a bike can also master riding in downtown Ann Arbor. He noted that a concern that had been raised against such a prohibition in the past involves families who want to bring their kids downtown. But Hieftje felt there would be ways to make allowances for that type of activity within the ordinance – for example, by exempting people of a certain age, or exempting people who are riding with their children. Jim Mogensen told the board he wanted to make some observations about student housing. He noted that a lot of student housing projects are being built. He observed that there is no zoning for student housing. He noted that the state legislature has discussed the idea of not allowing local governments to have non-discrimination ordinances, but he pointed out that Ann Arbor’s non-discrimination ordinance says that you cannot discriminate against people based on their student status. It doesn’t say that you can’t discriminate against students, just that you can’t discriminate against people based on their student status, he stressed. He emphasized to the board that the large student housing developments downtown are not temporary. That contrasts with the relatively temporary student housing projects built in “residential for cash” zoning districts. ["Residential for cash" is Mogensen's standard word play for R4C multi-unit zoning.] But the current projects that are being built would be much harder to redevelop, he cautioned. So the projects are going to be there, and they would probably have to be reused. He pointed to Courthouse Square as an example. That matters to the DDA for a couple of reasons, he said. When the numbers stop working, or if there has been over-development, the DDA board might find that people come ask them for some of the TIF money. The other thing is that some of the residential projects have been created with some assumptions about behavior – more walking and pedestrian use, for example. If these units are redeveloped for young professionals, no matter what we might hope will happen, Mogensen said, there will be a greater demand for cars, and that’ll be something that has to be incorporated into planning. He encouraged the board to incorporate that kind of thinking as a footnote to their planning. Ray Detter reported from the downtown area citizens advisory council (CAC). The group had discussed a large packet of written material, part of which fell into the general category of “building boom and tight rental market.” Detter then listed out a number of projects: the Library Lane underground parking garage, Blake Transit Center, the Ann Arbor District Library, The Varsity, 618 South Main, The Landmark, Zaragon West, City Apartments, the former St. Nicholas Church property, Ed Shaffran’s plans to put condos on top of the Goodyear Building, Howard Frehsee’s building on South State Street and his plans perhaps to put a high-rise on the back of that building, plans for the former Borders building, the Zingerman’s Deli addition, and the closing of White Market. Also discussed was an upcoming purchase of the Papa John’s Pizza property at Huron and Division – by the Connecticut firm Greenfield Partners. Detter noted that the firm had already purchased the neighboring property just west of Sloan Plaza. A project could now be extended all the way to Division Street, and Detter expressed his hope with the addition of the neighboring property, a better-designed building would result, and there would be better protection for the residents of Sloan Plaza. The CAC was supportive of these developments, Detter said, in the same way that the group has been supportive of projects in the past – by making suggestions for improvements and monitoring the review of projects as they go through the process, including the city’s design review board. Detter also described a range of different projects outside the downtown on which the CAC tended not to take positions. But because such projects would ultimately have an impact on the downtown, the CAC wanted to be involved in the ongoing discussion. Among the examples Detter gave were the location of a possible new rail station and the construction of a greenway. Present: Nader Nassif, Roger Hewitt, John Hieftje, John Splitt, Sandi Smith, Leah Gunn, Keith Orr, Joan Lowenstein, John Mouat. Absent: Newcombe Clark, Bob Guenzel, Russ Collins. Should one of those be July 2012 or June 2011? Re : That’s been corrected so that the comparison reads as it’s supposed to: June this year compared to the same month (June) last year. Another interesting (mis? )characterization, interpretation, and focus from Hewitt on the parking numbers, given the lower hourly patron numbers for July. (Thanks for the graphs, btw.) Does anyone ever ask questions about his “report”? I just spent $2.40 to go to a one-hour meeting at the AADL. (Parked at 4th & William.) One of the relatively recent changes to parking charges was the unitary charge for any part of an hour. I’d say I contributed nicely to the revenue stream. Interestingly, I was able to park on the first floor and there were other empty first-floor spaces when I came back from the meeting. Rounding up to the nearest hour instead of half hour is a rate increase. The DDA doesn’t like to call it that, but that’s what it is. Can someone remind me why we need the DDA to write the contract with Republic Parking? Why is writing the Republic Parking contract something that existing city hall staff are unable to do (competently? )? Speaking of delegation of duties, can anyone explain to me why the Mayor is asking the DDA to forbid bike riding on downtown sidewalks? Isn’t it the responsibility of the mayor and council to pass new ordinances?